A guest post by Ulli. We met up at Carlisle railway station, with six of us arriving just over an hour before the off, so we had time for a drink and for getting to know each other a bit (I only knew Marcus, the organiser, but others were clearly old friends, or had met before). 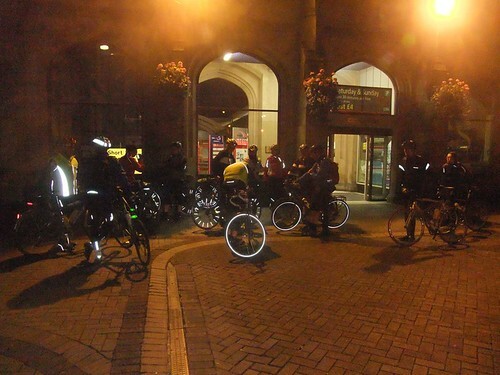 There was a mix of people, some regular night riders and a few complete newbies, myself included. 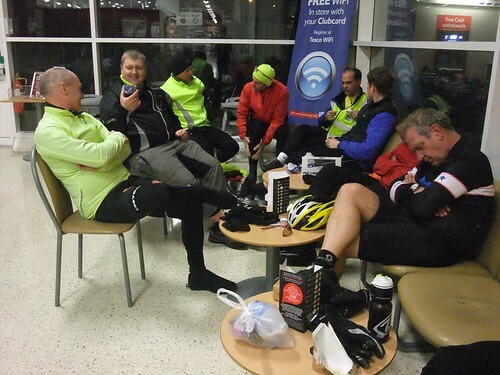 The first stop was just a couple of km later, at the 24-hour supermarket at the eastern edge of Carlisle, to stock up on snacks, buy a woolly hat in expectation of the temperature dropping and/or use the facilities. While we were waiting outside, a policeman came up and asked us what we were up to. Our explanations bemused him, and when we asked if he wanted to come along, he declined politely. Soon we were off again, heading east along the A69 to Brampton. Normally this road would be a bad choice for a group cycle ride, but just before midnight there was hardly any traffic, and we were off onto the wee roads before very long, cycling through the deserted town, where we joined the NCN72 (Hadrian’s Wall Cycle Route) which we’d follow on and off for most of the way to the other side of the country. Shortly after Brampton, we went past Lanercost Priory, a beautiful ruined abbey that was built to a large part from nicely prepared stones, freely available from some old wall nearby at the time – some stones with Roman inscriptions, mason’s marks and even the knee of a broken statue with toga folds still visible. [Kim and I had stopped and visited the abbey and pretty much all the Roman sites along the Wall and a few nearby castles in April, during a long weekend – he never got round to writing a blog post about it.] 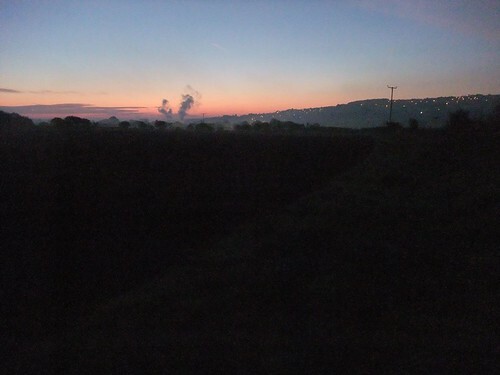 But during the night we only saw the signposts, and I could just about make out the dark silhouette of the tallest building against the little light provided by the very orange crescent moon that was rising to the east as we came over the hill from Brampton. Soon after, we hit the first proper hill at Banks which I remembered well, including the various twists & turns, so there were no surprises, but it was quite different riding it at night, seeing the various blinking red lights moving along ahead and bits of the road illuminated by some pretty powerful front lights that provided plenty of brightness to see by, both ahead and behind. We stopped at the turret/watch tower at the top of the hill to re-group, have some snacks and admire the starry sky. After switching off all the bright lights, the Milky Way was clearly visible, and so many more stars that I’d seen in a long while, due to the clear skies and absence of light pollution (even though we could see the lights of Carlisle in the distance, but they already seemed quite a long way away). Somebody was asking about the wall, and I said there was a bit just off to one side and switched the front light on, pointing it straight at some rather impressive looking remains that he (and possibly others) had been completely unaware of, having not had the advantage of seeing the place in daylight before. I was then leaning on my handlebars, and there was suddenly quite a large amount of give. I was thinking that this was rather strange, as my bike didn’t have a front suspension. It was a slow puncture that I must have picked up on the way home from work in the evening (which already seemed a world away), where I had tried to avoid some hawthorn hedge cuttings. Luckily I had a spare inner tube etc. with me, and between a few of us the puncture was fixed very quickly – many thanks to the expert fixers, much faster than I could have done it myself. It turned out to be the only puncture of the night, there were a few other very slight mechanicals, but nothing serious, thankfully. Where the hill finally flattens out, there is a wee turn-off to the Roman Army Museum and the B&B where we stayed on our spring tour and had a very nice and hilarious evening meal with a group of walkers going the opposite way, but I digress. There was yet more police presence, this time a patrol car parked with a friendly police woman asking the obvious questions as we waited for everybody to conquer the hill … what were we up to? … and of course, why? … We had quite a long chat, but eventually headed off along the very straight B6138 along the Wall which was completely deserted, apart from some owls hooting somewhere off to the right. I think it was somewhere along this undulating B road that we came across a solo cyclist going the opposite way – we all said hello, like it was the most normal thing in the world to go cycling in the middle of the night and carried on cycling. At this stage, it might have been around 2 AM (? ), I was starting to wonder when I might begin to feel tired, but Cathy, another 1st time night rider, and I agreed that we couldn’t possible have been more alert and alive than we were feeling. Maybe because it was all new to us and such an amazing experience, or because the temperature was dropping and stopping us from getting sleepy? After another quick stop near the intriguingly named Twice Brewed Inn (and Once Brewed Hostel), where a slack chain was sorted, we soon left the deserted B road and headed down the 6-mile long descent to Newbrough along the Stanegate road. We were spread out again, and after I dropped back from the front group to add more layers, I was suddenly all alone. I could occasionally see the twinkling red lights of the front group ahead, and the yellow glow of the group behind just over my personal horizon, but this made me even more aware of just how quiet it was, apart from another owl, some sheep bleating off to the left, and suddenly a rather loud noise, from an invisible donkey that must have been startled by the strange flashing lights disturbing its peace. Another quick stop to regroup resulted in a search for a dropped glove, which was eventually found on the other side of the stone wall next to the road and restored to its owner by a kind gentleman hopping over the wall. Suddenly the silence was interrupted by a polite sounding cough from the field over the wall, from the complete darkness outside the circle of lights surrounding us. “What was that?” We shone a light over the wall, and found a herd of cattle just a few metres away, panic over. We shot up the slight incline beyond the bridge, past a signposted left turn for the riverside cycle route, but I assumed that this was intentional, grateful for the additional heat generated by the extra effort, as I was feeling quite cold at the time. We stopped where the road met up with the dualled A69 and some fast moving delivery lorries thundering past, to wait for Marcus, who was leading from the rear at this stage … only to decide to turn back to re-join the NCN72 by the bridge. A little further on, on the edge of Hexham, we crossed over the railway line, and quickly reached the 24-hour supermarket that was our main planned food stop, it must have been a little after 4 AM. Just outside we were met by the very wide awake 14th night rider, who had made his own way to Hexham on his rather fetching trike. We all piled into the supermarket and did our shopping before congregating in the deserted café, where we scoffed an interesting assortment of foods. I saw sushi, sandwiches, rather colourful iced doughnuts, bananas, a large yoghurt pots very politely emptied with the folded up lid used as a spoon replacement, etc. Soon the first heads started to nod, and one body was stretched out on a row of chairs, fast asleep within seconds. And more … while others were wide awake! I was starting to warm up quite quickly once the food had found its way into my system (lesson learnt: body needs feeding if it is supposed to function properly in the middle of the night). But I still followed the example of somebody else and went on another shopping trip, to buy a pair of tights to wear under my rather ancient and thin Ronhill tracksters – I found some rather nice thermal tights which were perfect for the rest of the ride. Somebody mentioned that the lowest temperature he had measured during the night was 3-point-something degrees C.
Around 5:20 we were on our way again, leaving the bright lights of Hexham behind and heading back onto the NCN72 towards Corbridge. I thought I could make out a very slight brightening in the sky to the east, but wasn’t sure whether this was dawn starting to break or just an artefact of the slight mist reflecting our lights. Near the entrance to Corbridge Roman Town [another site looked after by English Heritage and well worth visiting – I’ll stop the tourist ads now] we came across another couple of well-lit cyclists going in the opposite direction, not sure if they were early commuters. In Corbridge itself, we met the early commuter bus to Newcastle and a few more delivery vans and lorries, but after the hill at the eastern edge of the town we soon turned off onto a wee road again. 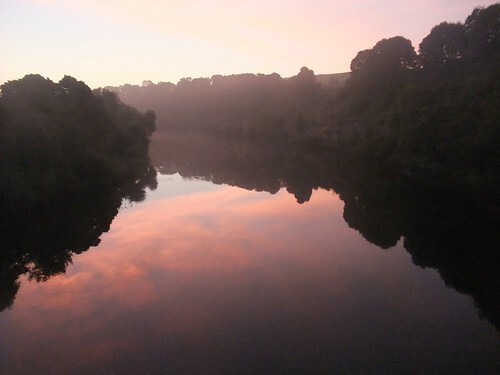 By this time there was an orange glow on the horizon, and we could see the silhouettes of hills, trees and Prudhoe Castle with some very picturesque bits of mist floating about. It really was magical, words can’t do it justice. The wee road was twisting and turning, and there was a sudden steep uphill, which caused somebody on a fixie to start weaving across the road rather unexpectedly, right in front of me. I stopped and then had to walk a few steps to the top of the wee hill as I was in the wrong gear, whereas said fixie rider keeled over at 0 speed, fortunately the only injury was to pride, rather than rider or bike. At Ovingham, we crossed a pretty spectacular old bridge on stilts, clearly not built for modern traffic, but just about wide enough for single cars, as long as they weren’t too big… demonstrated by one car following us across. Immediately after the bridge, the cycle path heads off road and east along the Tyne, before crossing back north again after a few km, over another impressive bridge, this time a single span metal one. We stopped there for quite a while for photos, chatting and watching some rather large fish jump out of the water to catch insects, and I am pretty sure I saw a bat hunting close to the water surface, too. By this time the first dog walkers were out in force, and most of us switched off at least some of our assorted bike lights, as they were definitely no longer needed to see by. 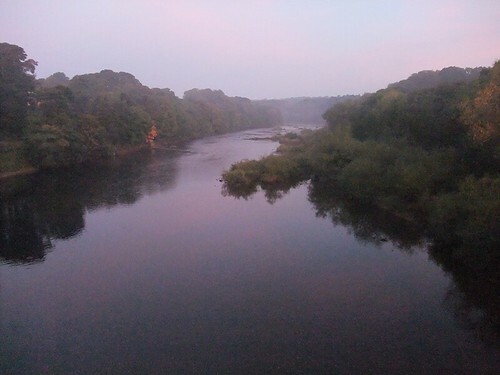 The cycle path meandered along through woods and fields, with the sun rising as we neared Newcastle. Along the river, several herons were flying about, and we went on a slight detour due to some of us rushing ahead in our eagerness for breakfast – by this time I had been looking forward to a nice hot cup of tea for hours … we passed by a very closed looking café in an industrial estate, where on last year’s ride coffee and tea had been available, but sadly not this time. 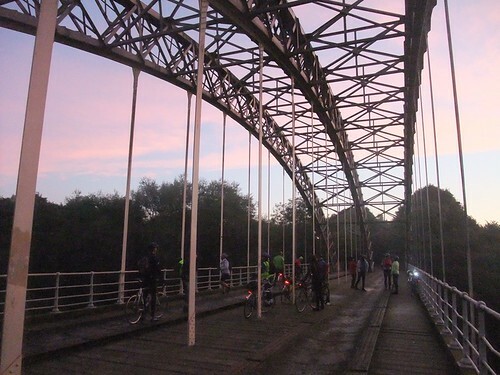 We pressed on around another bend or two in the river, and under the A1 motorway bridge. The path then left the river again and we cycled along a massive multi-lane road, on a shared pedestrian/cycle path that crossed over said lanes a couple of times via pedestrian lights and a big roundabout. As it was only 7:30/8AM on a Saturday morning, we didn’t really have to stop or wait anywhere, as there was only the odd delivery vehicle or car around, but I was thinking this must be pretty unpleasant during rush hour. Soon we turned back to the riverside with its wide pavement, along the tidal mudflats of the Tyne with lots of wading birds, ducks and gulls enjoying the early morning sunshine, and a fair number of cyclists and walkers doing the same, but on firm ground. The famous bridges across the river finally came into view, and suddenly we were at the Quayside, our breakfast destination. We parked up and shared bike locks before piling into the place, where the only other customers were a couple of fellow riders who had decided to meet us at for breakfast after their own night ride rather than doing Carlisle to Newcastle. That first long-anticipated mug of tea was SOOO good, followed by a massive breakfast and more tea. We compared photos, sent messages home to report our safe arrival. Some headed on to the Hub, a cycle café just a bit further down the river, after a while. But inertia claimed most of us, and we just stayed and chatted some more or rested our eyes for a little while, before it was time to head to the train station and our separate ways. I dozed for a bit on the train between Newcastle & Berwick, but didn’t actually go to bed until just after 10pm, and slept like a log. A massive thanks again to the Marcus for the idea in the first place, and for organising everybody, to all my fellow night riders for their company, help with fixing my puncture, and the entertainment … this definitely won’t be my last night ride, but I might wait for slightly warmer nights before I have another go. This post started as a thread on the CycleChat forum. Hi I only just found this info on cycle ride at night . I wondered if this sort of ride is still going on in 2016. I live in Wales (Carmarthenshire) so would need time to get things sorted . Thanks . 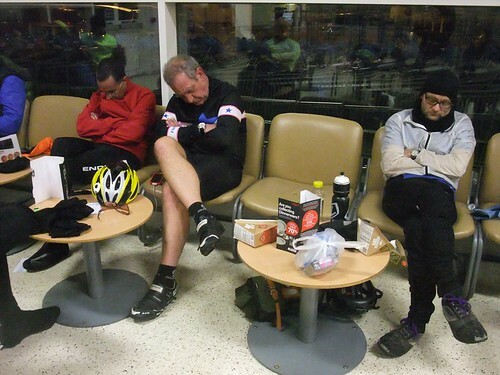 As I said to Mark, it is best keep an eye on Cycle Chat as that is where the rides are organised. It is very likely they will have another one as the last two were so popular. Sounds like great fun, when are you doing it again? I’d love to come! If you want to come along best keep an eye on Cycle Chat, here is the thread on last year’s ride and there is bound to be another one this year. "I thought of E=mc2 when I was riding my bike."